“To maintain our Nation’s competitive edge,” President Obama said this summer, “we must ensure that the United States has fast, reliable ways to move people, goods, energy, and information. In a global economy, where businesses are making investment choices between countries, we will compete for the world’s investments based in part on the quality of our infrastructure.” The president is absolutely right, and yet his environmental zeal stands in the way of American infrastructure growth. At a news conference with Canadian Prime Minister Stephen Harper yesterday, Obama told reporters that he would reject any Congressional deal that tied a payroll tax cut—something he has pushed for over the past couple months—to an approval for Canada’s Keystone XL, a 1700 mile pipeline that would deliver up to 830,000 barrels of oil a day from the Alberta tar sands to America’s refining hub along the Gulf of Mexico. “Any effort to try to tie Keystone to the payroll tax cut, I will reject. Everybody should be on notice. The reason is,” he explained, “because the payroll tax cut is something House Republicans and Senate Republicans should want to do regardless of any other issues.” In other words, it’s his way or no way. The logic behind the payroll tax cuts, as explained by Obama, is that “it will spur spending. It will spur hiring.” Yet the pipeline will create $7 billion in investment and will create upwards of 13,000 private sector jobs without spending a single public dollar. In tough budgetary times, Congress and the president should be open ways to create jobs without more debt-financed stimulus. 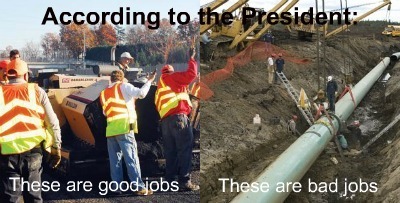 Republicans have tried just about everything to force the administration to approve the pipeline. In July, House Republicans passed a bill that would force the administration to make a decision about Keystone within two months of passage. Last week, a group of Republican Senators introduced a Senate version of the bill, The President’s continued refusal to consider a compromise plays well to his environmental supporters, but for the millions unemployed and millions more who see their incomes eaten up by high gas prices, his attitude is devastating. Previous post: How’s the Stimulus for Electric Vehicles Working Out, Mr. President? Next post: Has China Had a Change of Heart or Just a Change of Strategy?